Sublime Frequencies releases their first 78rpm compilations, and true to form these are sounds rarely heard by contemporary Western ears. These 2 albums (SF077/SF078) are compiled by Robert Millis, a long time Sublime Frequencies contributor and a founding member of Climax Golden Twins, He is the author of Victrola Favorites: Artifacts from Bygone Days (Dust-to-Digital 2008), a book of historic early recording documentation, ephemera and music drawn from Millis' 78rpm collection. In 2011, he produced and helped design "I Listen to the Wind that Obliterates My Traces" (Dust-to-Digital), a similar book drawn from the collection of artist Steve Roden. In addition to composition, sound art practice and design, he has filmed and produced experimental documentaries on Asian music: "Phi Ta Khon: Ghosts of Isan" and "This World is Unreal like a Snake in a Rope" (both for Sublime Frequencies DVD release) and is an obsessive collector of 78rpm music records and ephemera. 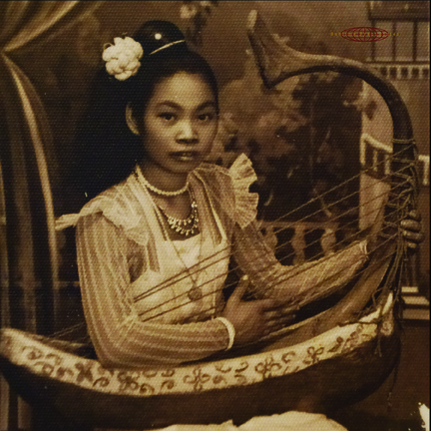 The Crying Princess (SF078) compiles rare Burmese 78rpm records gathered by Robert Millis and Sublime Frequencies co-founder Alan Bishop during various trips to Burma (Myanmar) and continues the tradition of amazing music from this Southeast Asian nation released by SF (Princess Nicotine, Guitars From the Golden Triangle, Music of Nat Pwe). Spanning the years 1909 to 1960 these unique and ridiculously rare records feature early sides by Po Sein (one of the giants of early Burmese music and theater), vocal and harp music from 1929, "modern songs with electric guitar," and unique Burmese pop songs with piano, all from 78rpm sources. This limited edition LP comes enclosed in a beautiful tip-on jacket with two-sided insert featuring liner notes by compiler Robert Millis.